Happy Saturday everyone crafty! 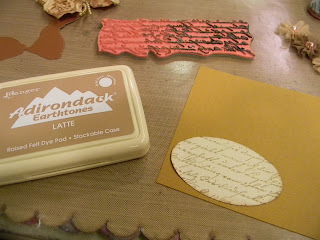 The challenge at Our Creative Corner is being hosted by Marcy Kaminski, of En Papillote Arts. She wants to know what's "In Your Easter Bonnet"? 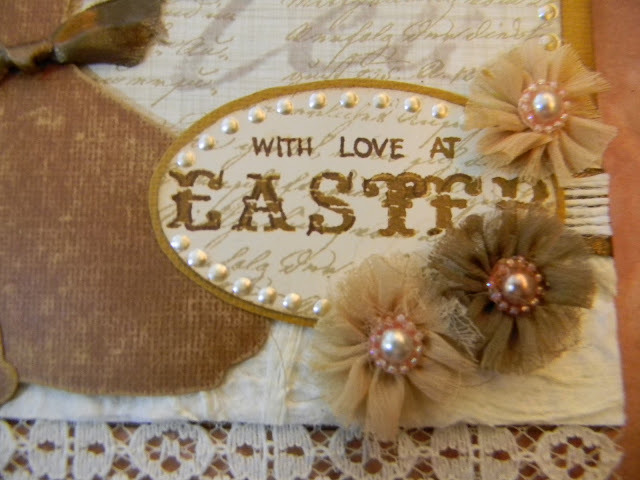 Design a card or project that is inspired by a frilly Easter bonnet. 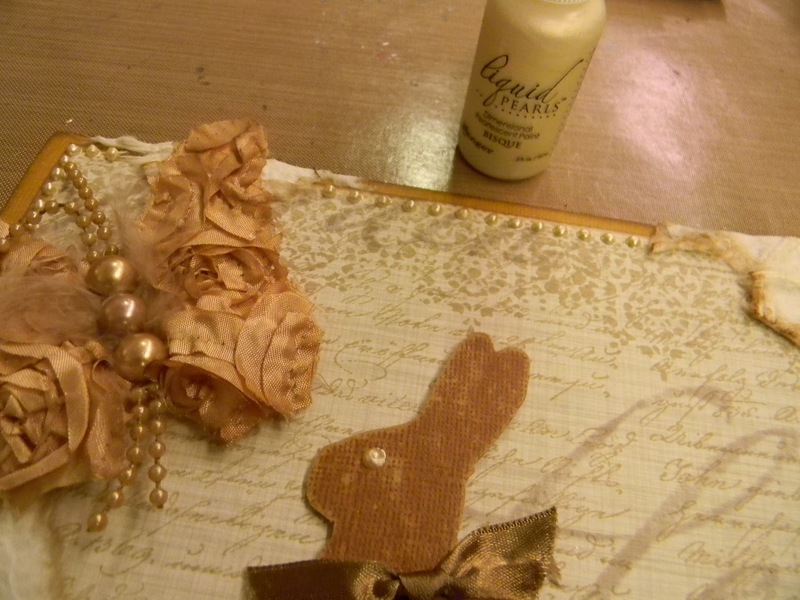 Use elements that you would put onto your own bonnet, such as lace, flowers, pearls, etc, and then link it up to OCC. For my card, which I am sending to my mother, I thought of what I wanted on my bonnet. I would want lots of ribbon and lace with neutral colors, but I also would like to have to have some chocolate bunnies on it...hey, it could happen! If you are looking for inspiration on gorgeous Easter bonnets, check out the rest of the OCC design team members projects. I had a sheet of this paper in my stash for years, and I loved that it said all sorts of Spring type things in French, like garden, dirt, flowers, the pretty land. I thought it was perfect for my Easter bonnet. 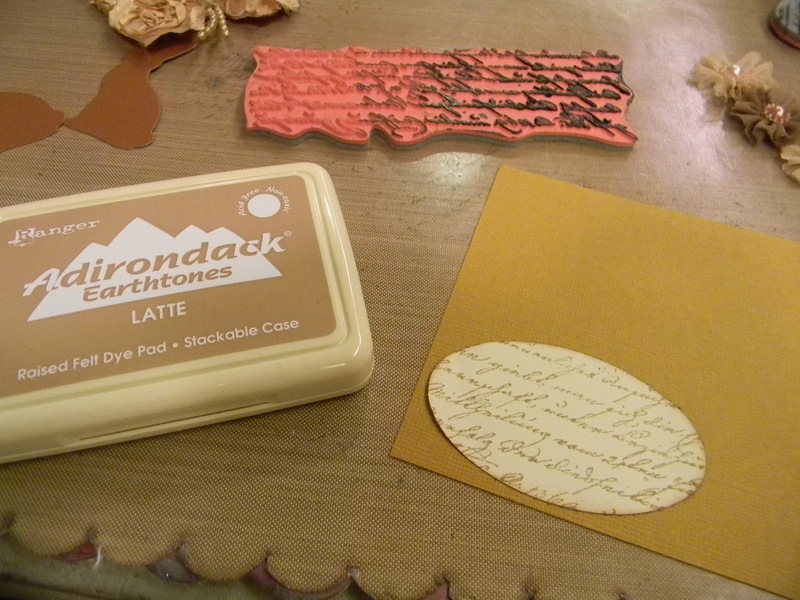 I stamped the letter image and scroll border in Latte Adirondack Earthtones Ink. I adhered the paper to the Kraft Core cardstock, and added ripped homemade paper that my son made me one year for Mother's Day. He said as he gave me the paper, "Mama, I know you really love paper, so I made you some." I know....there there...dry your tears. It's kind of like the coffee commercials...huh? Now, my children are enabling my paper hoarding! Anyway....I added lace and ribbon and ink. 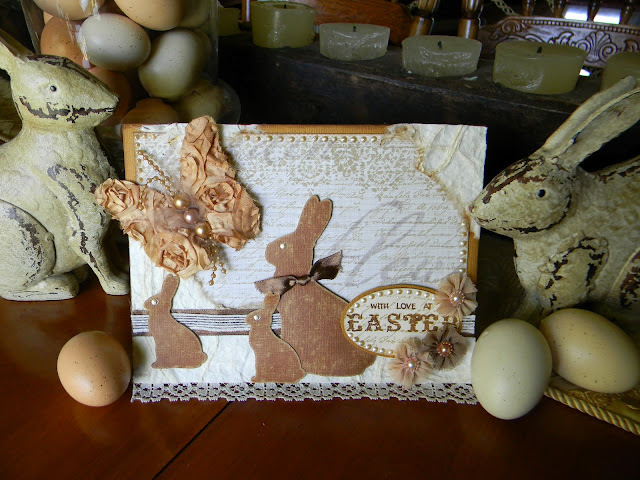 I stamped the same letter image in Latte on the background of my sentiment piece, then stamped the letters 'EASTER' in StazOn Saddle Brown. 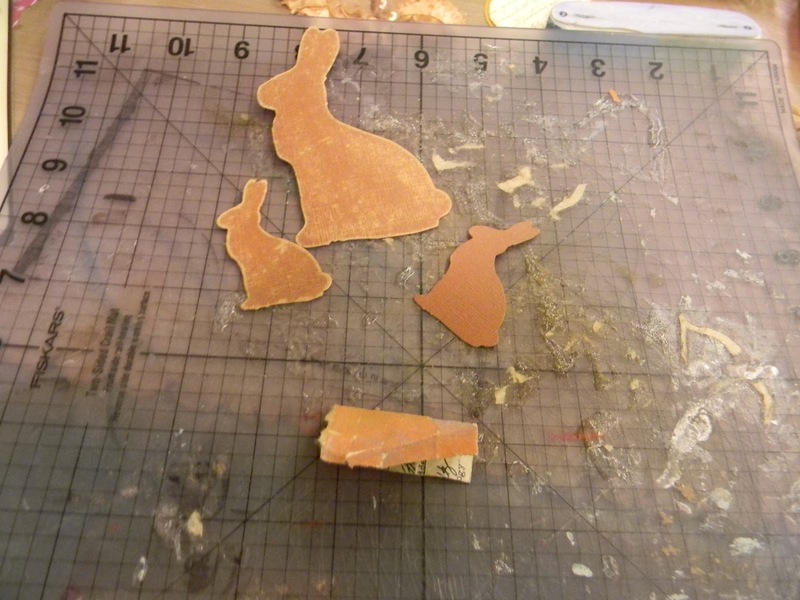 I diecut the bunnies out of Kraft Core and sanded them on top of my dingy, glue over, crackled cutting sheet, that I take with me traveling. 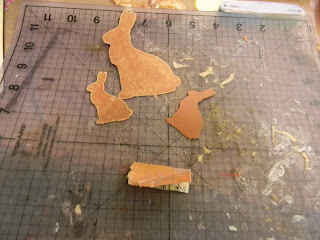 It caused little dots and cool shapes to appear on my bunnies...so cool! 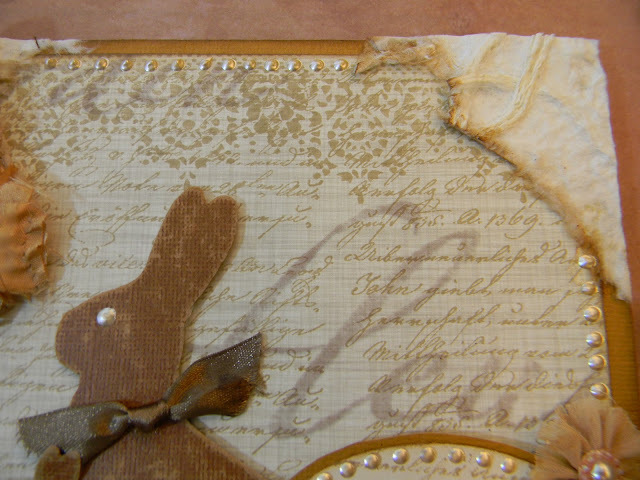 I used Liquid Pearls in Bisque to trim out the border of the card and sentiment, as well as bunny eyes, after I adhered Prima flowers and a butterfly made of ribbon, tulle, and pearls. I am submitting this card to the Artistic Stamper's monthly challenge of "ribbons and lace", the Blogger's Challenge of "to die for" (using die cuts), and Sizzix. Absolutely gorgeous Anita, I just adore the butterfly, it looks just stunning and adds wonderful interest, the card with the lace, flowers and pearls has a slight Vintage/Shabby feel to it, I am sure your Mum will love this card. Ooooh, so beautiful!!!! 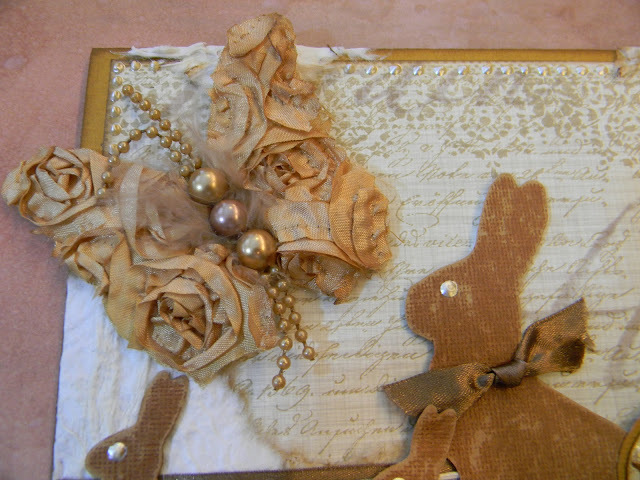 The butterfly is gorgeous & the bunnies look great against that lovely paper. This card is so gorgeous Anita,the bunnys are so sweet and I never saw a butterfly like this,absolutely stunning. I love your lumpy-bumpy bunnies! Makes them look so real. You will have to share the handmade by your son paper story with your mom when you give her the card. What a wonderful and thoughtful way to use the paper. Oh My GOODNESS!!! This card is ABSOLUTELY STUNNING!!!! Very vintagy and beautiful!!! I love all of the gorgeous detail!!! Anita, WOW! I just LOVE IT! First, I was so caught up in the bonnet additions I completely forgot about chocolate bunnies! LOVE yours. And what a wonderful idea of the ribbon/tulle butterfly! 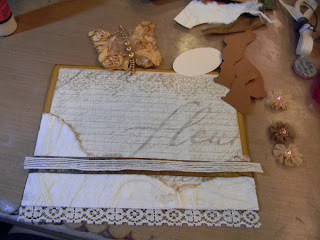 I love how you showed us a pretty paper and then added stamps and liquid pearls to really bring out the beauty in the paper. You are such a clever girl! I hope your mother loves your card as much as we do! Happy Easter, hugs, sharon w.
The goodie mail really did make my day! thank you so much. Anita, this card is over the top gorgeous!!! Those Roses...WOW WOW WOW!! What a beautiful card! Love that butterfly.... wowza!!!! And the bunnies are too sweet. Love how you've placed everything. Happy Easter to you and yours! 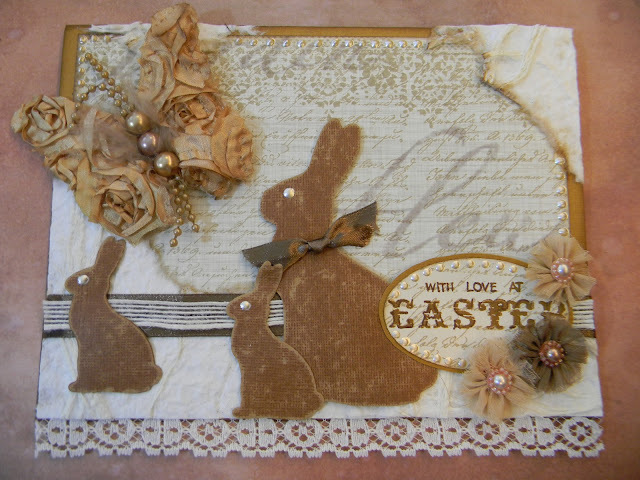 Wonderful vintage Easter card - love the ribbon butterfly! Thanks for playing along with the Bloggers Challenge! Love the vintage easter card! It's stunning, and I love the Mama bunny with the baby bunnies. So adorable! That ribbon butterfly is amazing! What a super card ... love those bunnies and that butterfly is just amazing, as is those flowers and gorgeous detailing! Super cute, love the bunnies and that butterfly is a show stopper!!! Such a lovely card, Anita. The butterfly and bunnies are so beautiful. Love the gorgeous background. This creation is elegant and absolutely stunning. Love the butterfly. Love the pearls. 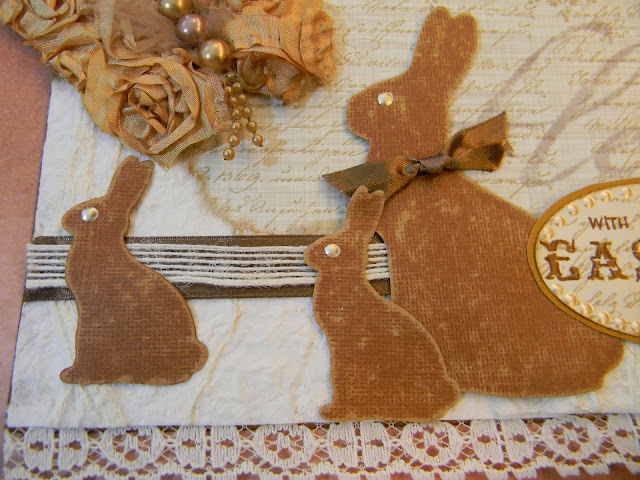 Oooh, how fab is this - your earth tones delight my eye and I totally love those sanded bumpy chocolate bunnies. 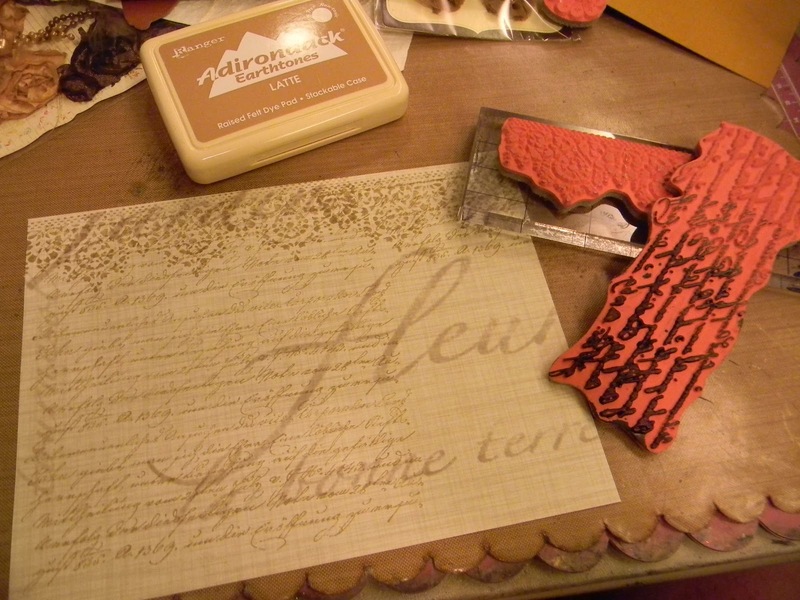 Super piece of work and I am totally intrigued by that ribbon butterfly - did you make it? LOVE it! stunning card, the butterflies are beautiful! Thanks for joining us at blogger's challenge.